EuroGeographics has announced it is planning a new core reference dataset using, where available, INSPIRE-compliant geospatial information from official national sources. 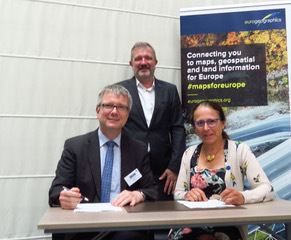 The international not-for-profit membership organisation for Europe’s National Mapping, Cadastral and Land Registration Authorities (NMCAs), has signed an agreement with Germany’s Federal Agency for Cartography and Geodesy (BKG) to coordinate technical production and quality management. A prototype, focusing on transportation (road and railway) and hydrography themes, is to be available in Autumn 2018 and will also include basic feature types and attributes. This will be followed by the launch of the first version of the new dataset in Spring 2019. The core reference dataset is part of EuroGeographics’ wider vision for European Location Services, a unique and powerful source of harmonised geospatial information from official sources. After delivering the prototype, the intention is to include additional themes such as buildings or settlement areas, addresses and elevation, and to offer coverage for all EU and EFTA Member States and EU Candidate countries. Production is dependent on sustainable funding being secured.